At the moment we are working on new research in the area of counter weight between a dancer and a transforming object of differing weight. Wishing to transform the relation between the dancer and her gravity gradually and with great precision to allow freedom and variety of working with gravity in a dynamic shift. The goal is to give the dancer a great freedom to travel vertically and horizontally while demonstrating that with each possibility we find, a restriction occurs. The dance exists and thrives within that tension. The research is conducted through a series of residencies around Europe and mentorships of the following VDF companies: Cie Retouramont (Paris), IADF/Fidget Feet (Ireland), Gravity & Levity (UK) and Il Posto European Vertical Dance Centre (Venice). The residencies are supported by the Danish Arts Foundation grant, International activities. 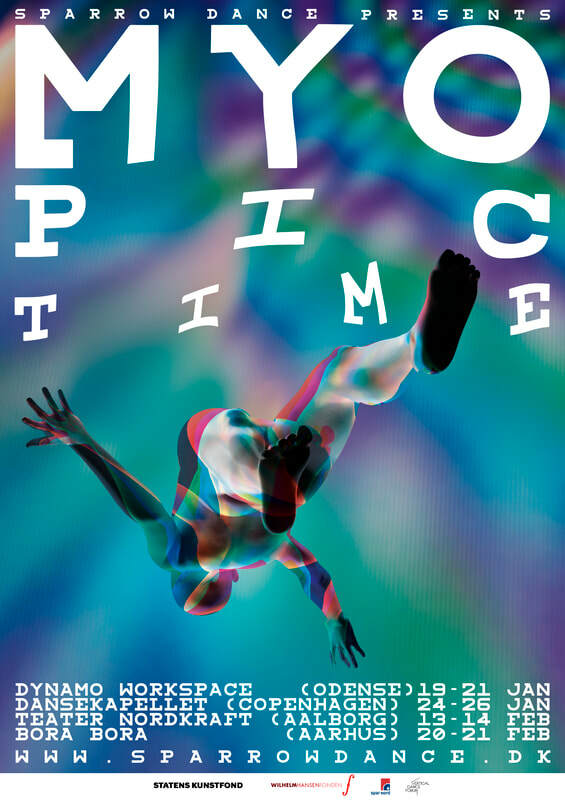 Myopic Time will premiere on the 19th of January 2019 at Dynamo Workspace in Odense in Denmark. and will then after go on a danish tour to Copenhagen, Århus, Ålborg and Skagen. Exact performing schedule is announced on our calendar.